(Bloomberg) -- The epic battle between bond traders and the Federal Reserve may be drawing closer to a truce. The central bank’s latest interest rate projections, due Wednesday, are likely to bridge some of the gulf between its year-end 2018 outlook and the market. Traders are positioned for a cut by the end of 2020, while the majority of policy makers envisaged at least three more hikes. Most market watchers expect the more-aggressive projections in the Fed’s so-called dot plot to come down this week, shifting the middle ground to just one hike this year and possibly another in 2020. 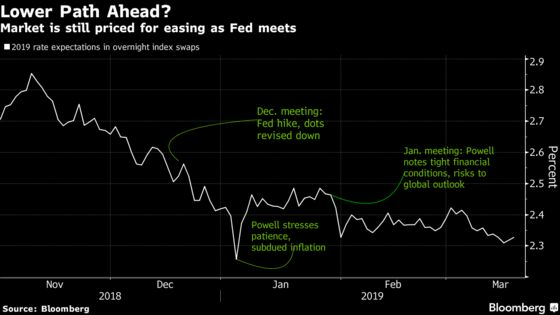 That would better align the Fed’s official outlook -- now three months old -- with its recent pledges to be patient in adjusting rates, and could disperse some of the market’s staunchest doves. When the Fed lowered its projections in December, traders judged that officials were still not being sensitive enough to growing headwinds, and added to bets on a cut. Interest-rate markets are close to the most dovish point of this cycle. But this time the market’s reaction could be different. If the fresh projections center on just one hike this year, down from two, some strategists see short-dated yields rising. For UBS Group AG, that’s a recipe for flattening in the two- to seven-year curve. TD Securities recommends paring bets on a 2019 cut based on that Fed outcome. “If we see the near-term dots and they’re still expecting a rate hike this year and next year -- they’ve only taken out one -- I think the markets would find that hawkish,” said Nathan Sheets, chief economist at PGIM Fixed Income. In a sign of investors’ dovish shift this quarter, two-year Treasuries yield 2.46 percent, compared with about 2.7 percent before the Fed’s December decision to tighten for the ninth time since 2015. Traders are pricing in about 30 percent of a quarter-point rate reduction this year, and a full easing in 2020. That overall positioning means the bar is relatively low for the message to be taken as hawkish. “Threading the needle to come off as neutral is likely to be difficult,” Nomura Securities strategist George Goncalves wrote to clients last week. His base case is for the midpoint to imply no hikes in 2019, and possibly one in 2020. The delicate nature of the Fed’s task this week means it could still tip the market deeper into dovish territory. Contrary to conventional wisdom, fighting the Fed has been profitable for investors over the past six months. Policy makers have gradually pared their more aggressive rate-hike projections as traders have positioned for a much swifter end to the cycle. If the Fed is perceived to have capitulated to the market on Wednesday, by ratcheting both tightening and growth projections lower, traders may double down on rate-cut bets. Another dovish pivot “runs the risk of undesirable implications as investors would begin to wonder ‘what does the Fed know?’ about a potential impending global synchronized downturn,” BMO Capital rates strategist Ian Lyngen wrote this week. There’s a precedent in the current cycle for the near-term median dot to drop by more than a quarter-point: It happened at the start of 2016, when global growth concerns kept the Fed on pause until December. Perhaps the biggest potential surprise, which would risk widening the divide between the Fed and traders, would be if policy makers leave their views little changed. That could be the wild card in terms of market reaction, possibly driving stocks and yields lower as the notion of policy error sets in and spurs haven buying. Lisa Hornby, a fixed-income portfolio manager at Schroder Investment Management, says another hike this year -- or even two -- is a realistic scenario. She’s unwilling to be short duration at this point as overseas demand in a negative-rates world is likely to cap U.S. yields, in her view. But she’s skeptical that officials will guide their rates projections much lower, as that would limit their ability to act if growth strengthens as she expects. The dot plot’s potential to bind the Fed’s hands is one of its drawbacks. Chairman Jerome Powell has expressed concern over how the market interprets guidance that’s intended more as a scenario, based on economic expectations, than a fait accompli. As a result, the dot plot -- which first appeared in 2012 -- may be up for an overhaul as part of a broader review of Fed communications.